A penny a day keeps the Dr away. 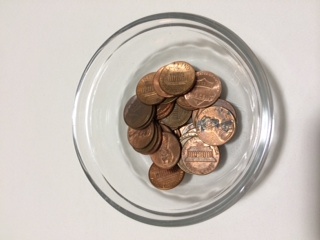 Add a penny to your favorite bowl each day you successfully keep the healthy habit. Keep the bowl in a highly visible location. Watch the pennies grow and take pride in your success. Choose wisely. Changing habits is hard. Minimize the change by making it simple. Be at least 80-90% confident that you can do it consistently. Increase the complexity of the habit only as you feel confident you can keep it up. Be accountable. Everyone needs accountability. Maybe its a daily contribution to a bowl of pennies, an X on the calendar, or a face to face with a coach/trainer. Know who you are and what help you need to succeed. Reminders will help you make your New Year’s resolution stick. Keep up with this year’s New Year Resolution for 6 months, and you will have long term success. Add more BRIO to your life in 2014. Create a healthy habit today!